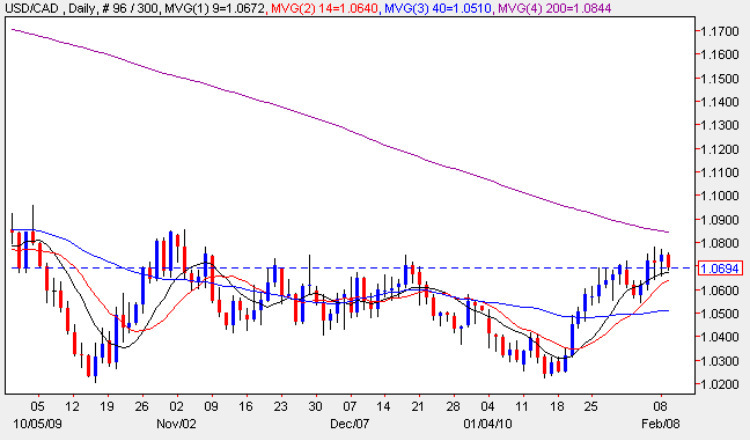 The usd to cad forex pair continued to lurch higher again yesterday, closing with a narrow spread up candle with a deep lower wick which once again seemed to find some support from the 9 day moving average, a positive signal in the short term that the recent rally looks set to continue. With the lower level of the price channel of the last few weeks now firmly established at the 1.02 price level, the likelihood of the usd to cad sinking to parity seems to have receded once again, as the short term recovery continues supported by the short term moving averages. However, we are now approaching two key technical levels which could provide a barrier to any further progress in the short term, the first of which is the 200 day moving average. which now sits immediately above. In addition the 1.08 price level heralds the start of an area of deep price congestion, which will require sustained momentum if the move is to continue, and as a result we could see the recent rally falter at this level. Technically therefore the daily usd to cad chart, whilst remaining mildly bullish, could now be running into some serious resistance in the next few days, which could see the move falter in the short term. Only a clear break and hold above 1.09 coupled with a breach of the 200 day average will signal that the move is likely to continue. Today is another day of thin fundamental news, with the forex markets once again trading on rumour and speculation, and for the usd to cad pair we are now waiting for the Canadian and US Trade Balance figures due out tomorrow. For the US the forecast is for -35.7 against a previous of -36.4 and for Canada -0.1B against a previous of -0.3B, and with both sets of figures released simultaneously this could result in little movement in the pair, unless one or other is well above or below forecast. Later in the day we have FED Chairman providing testimony to the House Financial Services Committee, and as usual this comes in tow parts. The first is a prepared statement (a text version is made available on the Fed’s website at the start), which is then followed by a question and answer session from committee members. Since the questions are not known beforehand they can cause heavy market volatility as a result as the forex markets ( and others ) listen to his unscripted replies for clues to future FED policy. In addition tomorrow, we also have crude oil inventories, which as always will have a greater impact on the Canadian dollar, rather than it’s US neighbour, given Canada’s standing in the energy complex. Last week’s numbers saw a big build in reserves which surprised the markets. In summary, what is curious at present for the Lonnie is the lack of upwards momentum given the recent surge in the US dollar of the last few weeks which has seen other major currency pairs trending strongly as a result. Clearly for the usd to cad this has not been the case, and part of the reason for this is the huge influx of capital into the country, with Canada seen as one of the few countries to avoid the worst of the banking crisis and economic slowdown, coupled with its preeminence as a leading player in the energy complex. As a result we could see a further period of sideways consolidation in the medium term, unless the technical breakout outlined above occurs in the short term.